And this is to say nothing of the competition and self-identifying that goes on once ‘who is the most compassionate?’ becomes the norm. We are all still creatures subject to vanity, pride and false pride, desirous of praise and respect. This can create a stultifying, tribal in-group/out-group atmosphere where no one is really aware of the moral judgments they’re already making/simply ignoring. Working towards a theme: Politics tends to follow culture, but much culture seeps out of our institutions. And when our institutions charged with teaching what’s important to young people lose sight of certain kinds of judgment, ideology can seep in. As Scruton has pointed out, people want to be a part of something, to have meaning and purpose and common lights. Certain ideologies often lead to darkness, as can abandoning your own moral judgment in favor of the compassion and sentiment of the moment. What I ‘feel’ in the modern and postmodern transcendent quest for Self so often trumps what others feel and whether or not what one ‘feels’ is, in fact, true. Humanities departments across the fruited plain can display this most openly, having lost a lot of whatever intellectual rigor and pedagogy they once had. Unsurprisingly, many ideologues adept at colonizing low and mid-level administrative and bureaucratic functions have filled-in. Of course, one’s own experiences, emotions, and ideas do matter. In fact, they matter a lot. Many young people, precisely at the moment of questioning the duties they might have to family, loved ones, friends and fellow citizens most deeply, can become plugged in to ideologies of radical change and ultimately some variant of Marxist revolution. Here, individual duties, responsibilities and freedoms become secondary to a collectivist and authoritarian/totalitarian political project, which still leads to political dysfunction, utopian thinking, and much human misery. ‘Gleams that untravell’d world, whose margin fades. 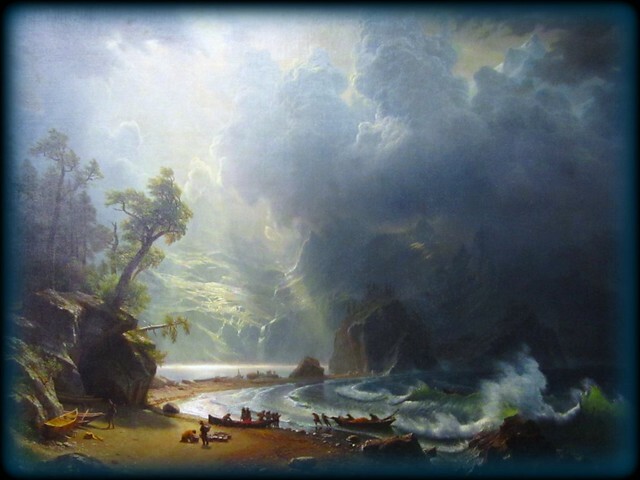 Below is Albert Bierstadt’s ‘Puget Sound, on the Pacific Coast, 1870″ which is on display the Seattle Art Museum (SAM). Bierstadt painted the picture without having seen Puget Sound! More on the Hudson River School here, with its strong roots in romanticism. From KentOfKent’s photostream on Flickr, part of his Olga Comes To Seattle series. How do we come to know nature? What do we do with all this wilderness? Aside from the political and sociological analysis, I would offer that there are many to whom environmentalism serves as a kind of religion (or at least a political and organizational entity offering purpose and membership). On this view, man has fallen away from Nature, and built civilized society atop it through harmful, unsustainable means. He must atone, and get back in harmony with Nature, as he has alienated himself from his once graceful state (tribal? romantically primitive? collectively just? equal and fair? healthy? “spiritually aware?” morally good?). This obviously gives meaning to people’s lives, a purpose, belonging and group identity as well as a political and secularly moral political platform. A majority of these folks are almost always anti-industrial, and it’s worthy of note how environmentalism has grown in our schools, marketplace, and in the public mind. It’s often tough to tell where the sciences end (and they are often invoked to declare knowledge that is certain, or near-certain, and worthy of action) and where a certain political philosophy (usually more communal, politically Left, Statist…regulatory, centrally planned economically) begins. Bjorn Lomborg is skeptical of ‘Earth Hour’ in Blinded By The Light. Go towards the light. How to separate reasonable environmentalism from the totalitarian impulses, the Malthusians and various other people who “know” how many people is enough? Now that environmentalism is a primary focus in our schools, it’s probably worth thinking about. ***It’s worthy of note how much subtle anti-corporate, anti-capitalist, communitarian political ideology has seeped into mainstream American thinking through the environmentalist movement, aside from any science.